In recent years the demand for organic products has increased and research shows that it will continue to increase in demand. For this reason we have included an extended range of organic products in our line of flour mixes that include country style type M 55% and 70% organic whole grain & organic compound bread. Suitable for bread and confectionary products. Suitable for organic wholegrain bread. 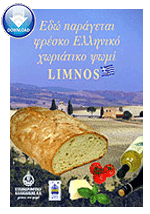 For organic wholegrain bread flour produced from organic durum wheat. Contains all the healthy ingredients in cereals, vitamins, minerals, fiber. For organic rustic yellow bread. Wonderful light rye bread with flavor, contains 20% rye.